A world like this must be destroyed. I believe it safe to assume that the earth was destroyed but not the entire universe. If Zeno did destroy the entire universe there wouldn't have been a way to use the time machine to go back and get him because time is a component of a universe. No universe, no time, no travel by time machine. The above was my original answer to this question until I read chapter 18 of the manga and Whis said the following below. Based off of this and prior knowledge we received in the anime that the King of All has destroyed universes before. I now believe it is safe to say that he actually destroyed the entire Universe in that timeline. So in summation after a little research I've come to a different conclusion. Even if existence as we define it comes to an end. Time does not, we may lose the capacity to quantify or comphrehend it but time is everpresent. I can honestly believe that this is a valid answer. I would like to believe Zeno destroyed all the universes in order to start again because Zamasu killed all the gods—that is, the Kaioshins of other universes. Zeno, being the childlike being that he is, decided to reset rather than try to find a way to revive everyone that had died (which I suppose he would not do since it's "unnatural"). 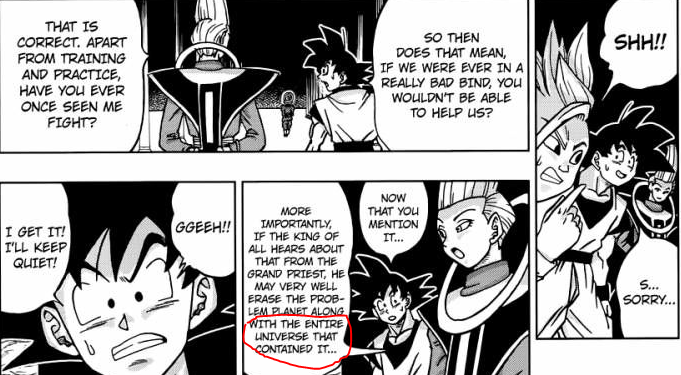 So, aside from the universe being corrupted by Zamasu, each universe was essentially without guidance. When Goku and Trunks go to retrieve future Zeno, you could see that he wasn't floating in space space, but an odd, distorted, white/blank space. This doesn't confirm whether or not he destroyed other universes, but it would kinda be an explanation as to why Zeno is okay with traveling with Goku. In the anime , Zeno states that a world like this should not exist and destroys the place. Since it states "world" and since the future timeline is different from the past timeline in DBS, I believe he destroyed the future timeline's earth, although I am just assuming this from the fact it says "world" in the anime. Did Future Zen-Oh destroy only Future Universe 7 or all 12 Future universes? Which universe is Future Trunks from? Does Dragonball super have only 1 underworld? Or one per universe? What is the true meaning of this phrase in Dragon Ball Super episode 80? Why is Zen Oh Sama destroying universes?